Whether you’re five, fifteen, or fifty sitting in one place for too long is not fun and is not great for using our brains in creative ways. A little break to get up and stretch. (Ironically, I’m writing this while sitting in an airplane seat that I will be in for the next 6.5 hours). A good, old fashioned strrrretttccchhhh is fine for adults. Our kids need a bit more than a stretch. That’s why I have the Sworkit Kids app installed on my phone. Sworkit Kids is a free Android and iOS app based on the popular Sworkit fitness app. Sworkit Kids features fun, short exercises that can be done in small spaces like classrooms. There are three categories of exercises in the app. Those categories are strength, agility, and flexibility and balance. 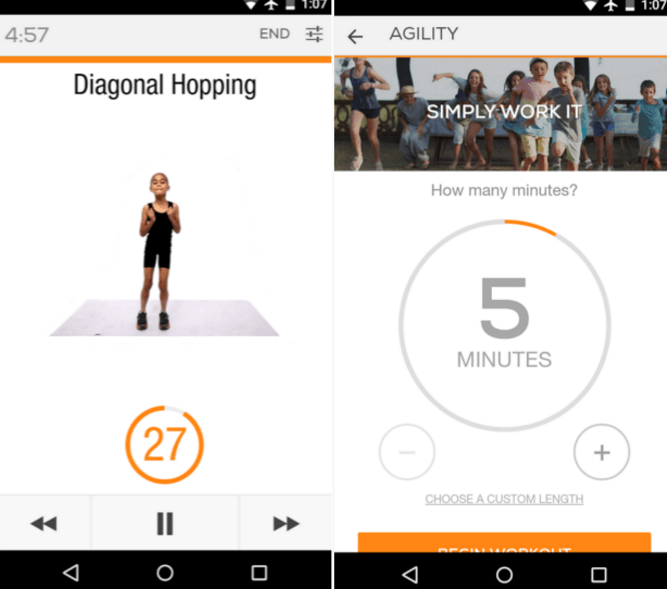 Within each category of exercise in the Sworkit Kids app you can choose the duration of the “workout” that you want to use. This can be as short as one minute or as long as an hour. After you have chosen a workout length the app will randomly display an exercise to do for a short interval (usually 30 seconds) before displaying another exercise in the category. Sworkit Kids includes a short video demonstration of each exercise. Verbal instructions are also included in the app. A short recovery time is included between each exercise display. The fun of Sworkit Kids is found in the exercises themselves. While it does include some “traditional” exercises like jumping jacks there are plenty of fun ones included in the rotation of exercises. For example, you’ll see movements called “windmill,” “cross country,” and “roller derby.” Of course, if there is an exercise that doesn’t seem right for your group, you can just fast forward past it. At the end of every series of Sworkit Kids exercises you will statistics including time spent exercises and an estimate of calories burned. How Do You Do Brain Breaks? Have you used Sworkit Kids or a program like it in your classroom? Do you plan for brain breaks or just implement them when your class seems to need it? Leave a comment and let us know.